Located in Ciudad del Carmen Municipality in Campeche State - 50 kilometers from the City of Carmen - Isla Aguada has it all to become the new tourism hot spot. Merida, Mexico, February 06, 2018 --(PR.com)-- With two village communities comprising over 10,000 villagers, the island which is connected with two bridges to the mainland has the most attractive beach in the State of Campeche for both local and international tourists. Mr. Michael King from Real Estate & Investments Solutions Ltd said, "Investors should turn their attention to Isla Aguada land investment, as at the moment the land price on the island is much cheaper than the other beach areas developed in Yucatan, where speculation from investors, in particular, Mexican, European, US and Canadian, is pushing prices higher. 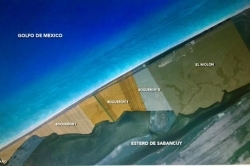 This is stunting ongoing investment in the coast of Quintana Roo State, and price speculation is becoming ridiculous. Regarding local MLS the average oceanfront prices on Isla Aguada beach however now are around $15 000 USD - 30 000 USD per linear meter - compared to over $190 000 USD linear meter along with the Riviera Maya coastline. Furthermore, the beaches of Isla Aguada are some of the finest in the region." Mr. Felipe Duque, CEO of BPB Ltd, a real estate consulting firm based in Cancun, said that "Eco-tourism development will offer a positive benefit for both residents and investors. Villagers will meet a great opportunity of land price growth for their plots of land - and their business opportunities will grow quickly now. Meanwhile, investors will receive a 100% guarantee that they can now safely purchase the land on the island with fully respected hard title ownership."